As some of you may know, last year I challenged myself to go a whole year without buying bread. This challenge allowed me to experiment with recipes and find what I liked best. We love bread. Or more specifically I should say, I LOVE MY BREAD! The other day while I was babysitting, one of the girls, who had just turn four, kept asking me for dough. I couldn't figure out what dough she wanted. There wasn't anything out. It dawned on me that the last few times she was over they helped me make bread. So that is what we did, make bread! :) I may soon be dubbed as "dough" mom. I am finally going to post the bread recipe I put together. This should make a few people happy (Holly and Hattie). Mix together the first four ingredients in your mixer with a dough hook. Add water and buttermilk all at once and mix for 1 minute; cover and let rest for 10 minutes (this is called sponging). Add salt, oil, honey and lemon juice and beat for 1 minute. Add last flour, 1 cup at a time, beating between each cup. Beat for about 6-10 minutes until dough pulls away from the sides of the bowl. This makes very soft dough. Pre-heat oven for 1 minute to lukewarm (170) and turn off. Turn dough onto oiled counter top; divide, shape into loaves place in oiled bread pans. Let rise in warm oven for 15-25 minutes until dough reaches top of pan. Do not remove bread from oven; turn oven to 350 F and bake for 30 minutes. Remove from pans and cool on racks. 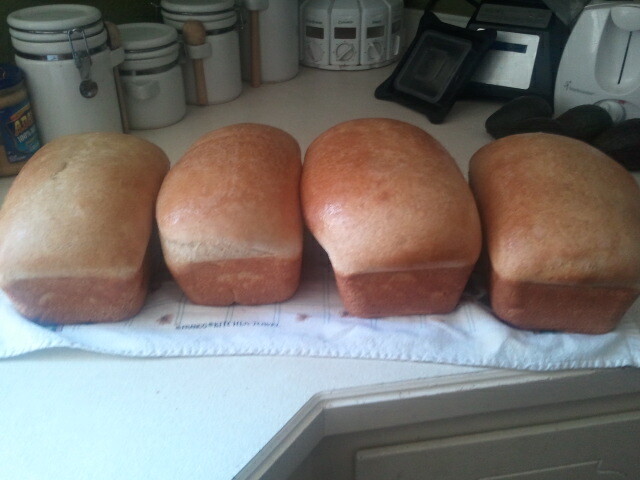 This recipe makes 4 loaves. *If you don't have buttermilk you may replace with water. I've done he same challenge! I'm really excited to try your recipe though, I can't figure out how to get mine to not be really crumbly? Maybe that's where the dough enhancer comes in. If you don't have buttermilk, you can make it. Put 1 Tablespoon of white vinegar or lemon juice in a measuring cup. Add enough milk to make one cup. Let sit a few minutes and stir. Wala, buttermilk.